Movies, documentries,episodes and TV shows that are good! A high school student who cares little about school or others meets a lonely girl who had to repeat a year while all her friends finished high school. He decides to hang out with her and soon meets more friendly students. Cyberdoll Kei: In time and space there is knowledge, will power, physical strength, endurance, avoidance, accuracy, behavior and experiences to master. The overused and implausible scenario where the male in the harem anime is inhumanly detached from natural emotion only when it serves the continuation of the indecisive heart of the male member of the harem? That's here. The lack of earning the woman's loyalty but getting it anyway? This anime has it in spades, and does an over the top job each time. That being said, it's cute, silly, and fun. I beg of you: don't use your time on this anime. You won't grow much from watching it. I was a fool not to check the reviews on IMDb before watching. But I'm glad it was only 10 episodes. Artistry is fairly simplistic, but colors are fairly vibrant. Perhaps it has something to do with being produced in 2001. 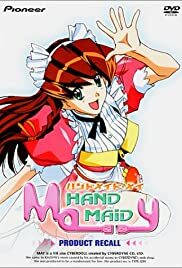 I'd write a longer review, but I simply don't want to think about Hand Maid May any longer.